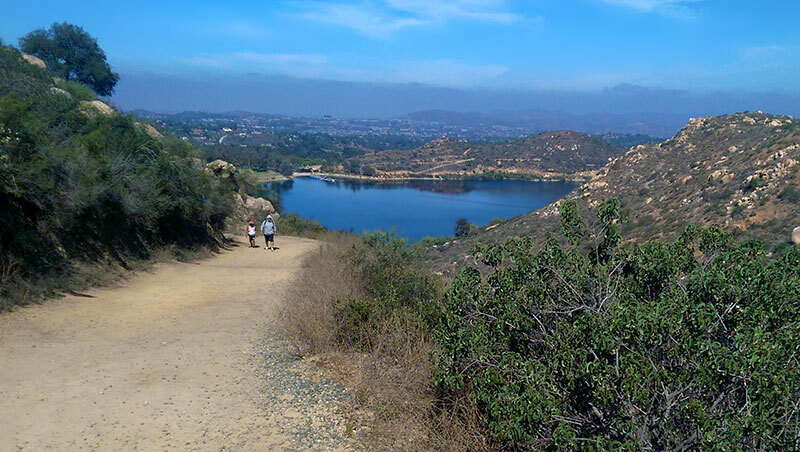 Distance: 7.25 miles | Hiking time: 4.5 hours | Difficulty: 7/10 | More info. Potato Chip Rock is a big part of the reason that people are able to motivate themselves to continue the challenging hike up Mt. Woodson Trail. The trail to the summit of Mt. Woodson keeps you working, but rewards you along the way with lookout points where you can rest, recover and take in the views. 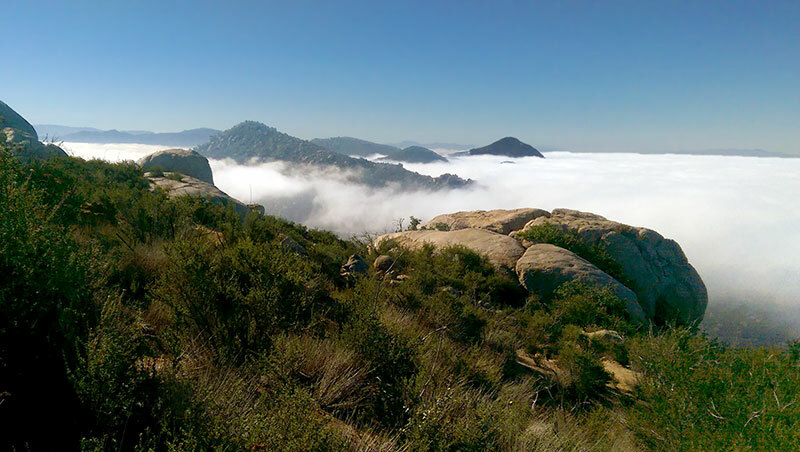 Upon arrival at Potato Chip Rock, the options are simple; continue on to the summit to enjoy the view, or wait for your opportunity to get your picture taken standing atop the iconic rock’s ledge. Whatever your reason for going, don’t hesitate. 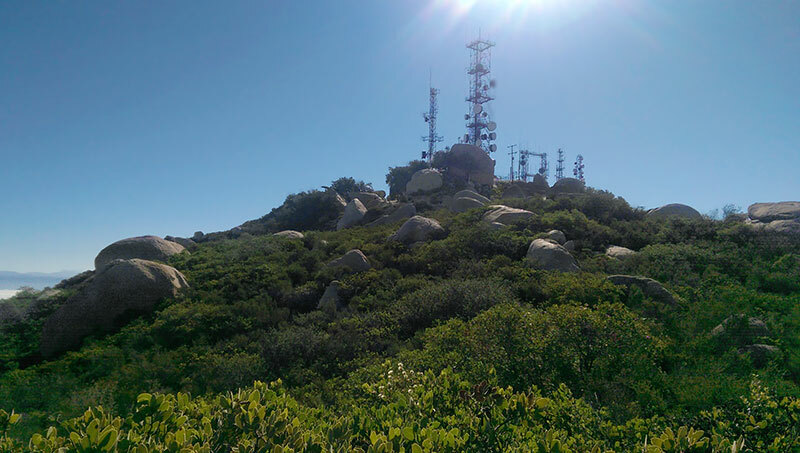 This is a fun hike that is well worth the time and effort it will take to get to the top, and the recovery time you’ll need later. 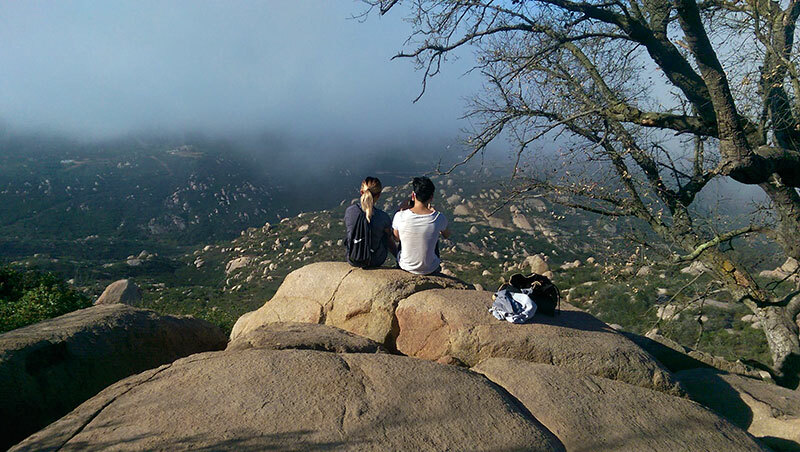 The hike to Potato Chip Rock is easily one of the most difficult, medium-length hikes you can find within San Diego County’s suburban boundaries. There are several trailheads leading to Mt. 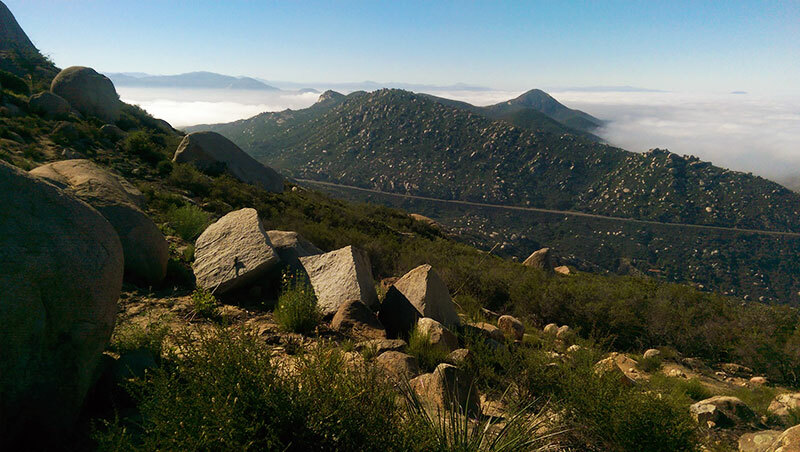 Woodson’s summit, but the most popular and scenic route starts at Lake Poway. The trail begins with a peaceful walk along the lake’s edge, where people go for a quiet day of fishing, boating and other activities with their families. 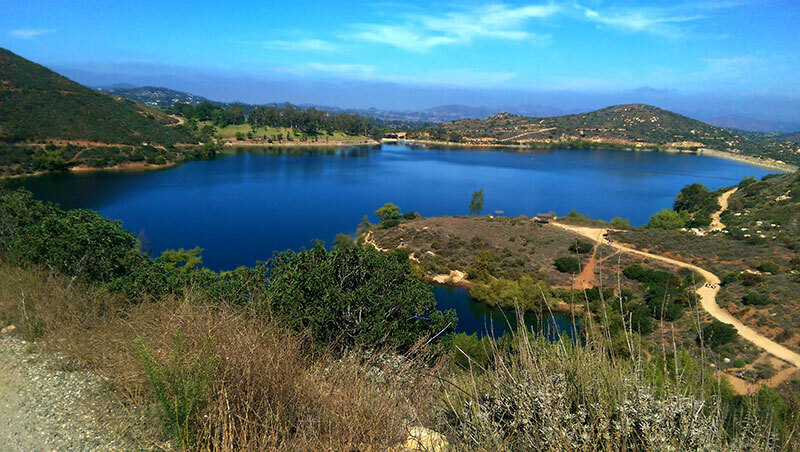 Entering the park usually costs $5.00 per car for non-residents of Poway. As long as you don’t arrive on a holiday, it’s a small price to pay if you appreciate easy parking, clean restrooms and direct access to the most well maintained route to the summit of Mt. Woodson. You’ll reach the trailhead for Mt. Woodson Trail at around the one mile mark. The trail (really a fireroad) leads straight up a steep hill, which can easily be seen from the other side of the lake. The next half mile is a heart pounding, quad busting 500 ft. of elevation gain, where you’ll often pass people who are running wildly downhill from the summit. occasionally, some pain-loving trail runner will pass you running up the hill. Other than that, most people choose a gradual ascent, stopping here and there to take in the view, recover their breath and enjoy a spot of shade if it’s available. At the top of the hill is a nice lookout where you can stop and enjoy the views while you take a rest before continuing on to the next section. At this point, the fireroad ends and the real trail begins. Once you’ve rested up, continue heading east toward the base of the next hill. After a couple hundred yards you’ll arrive at a fork in the trail marked by a sign pointing you toward the summit. It’s easy to miss the sign if you’re engrossed in conversation, so keep an eye out. 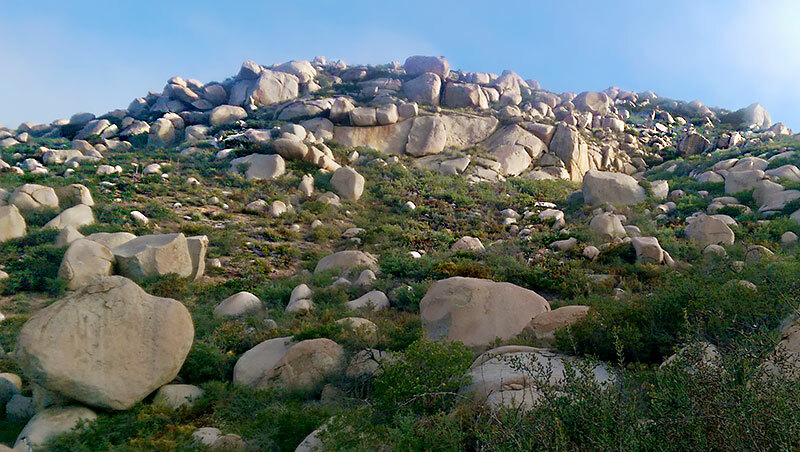 Otherwise, you may find that you’re actually heading down the mountain toward HWY 67, rather than up to Potato Chip Rock. Continue making your way up the trail. You’ll zig and zag, you’ll wind a little and whine a little, you’ll rest and recover, and eventually you’ll find yourself at an old tree standing by itself on the side of a large rock. Congratulate yourself, you’re past the halfway point. Take a break in the shade and enjoy the view, you’ve earned it. Enjoy it while you’ve got it though, because there’s not much shade available on the trail beyond this point. After leaving the shady lookout, the trail starts to let up a bit. 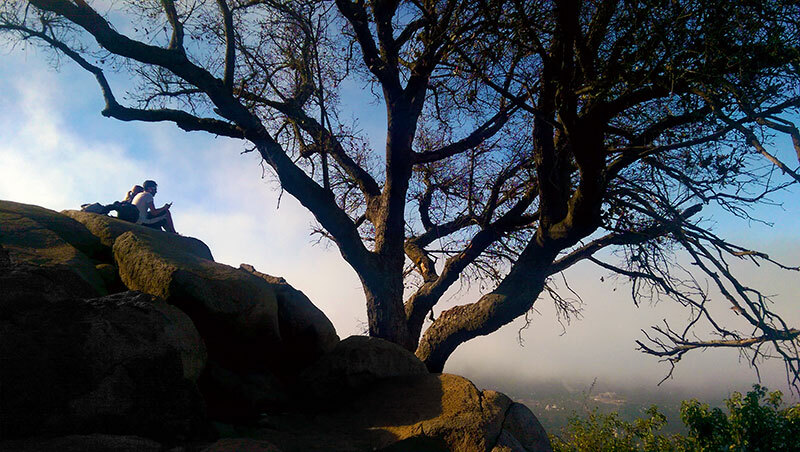 Continue making your way toward the summit and before you know it Potato Chip Rock will be within your sights. If you’ve made the hike on a holiday or weekend, prepare to stand in line for up to an hour before getting your photo-op. If you’d rather bag a peak than take a picture, then move on past the crowd and up the hill toward the towers that crown the summit. There you’ll find the east entrance to the summit and a plethora of less popular observation points where you can enjoy the view in all directions. I’ve been hiking Mt. Woodson on a regular basis since 2009. 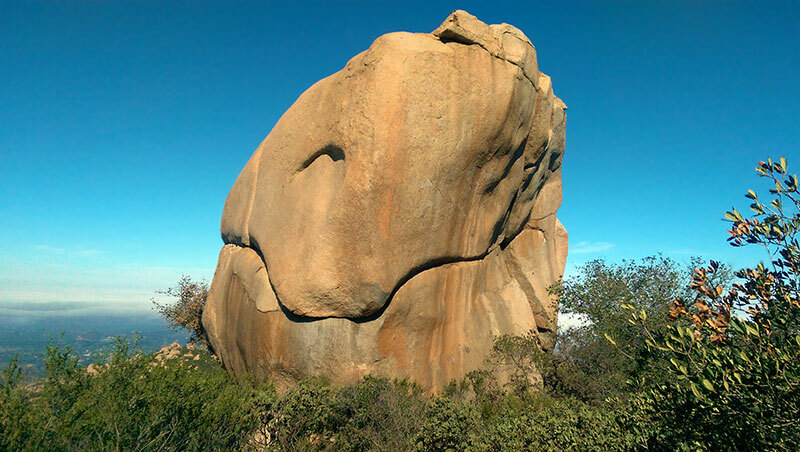 Back then, Potato Chip Rock was just another interesting rock formation that would occasionally draw an adventurous hiker to its ledge for a photo. 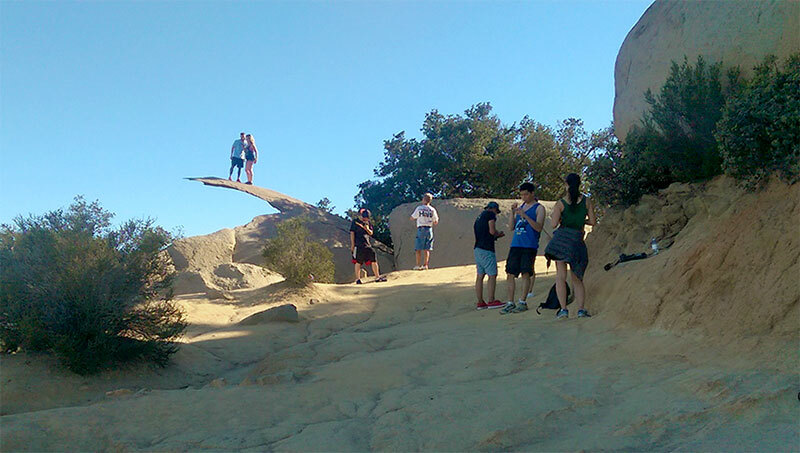 Since that time, Potato Chip Rock has become the Disneyland of hiking destinations. 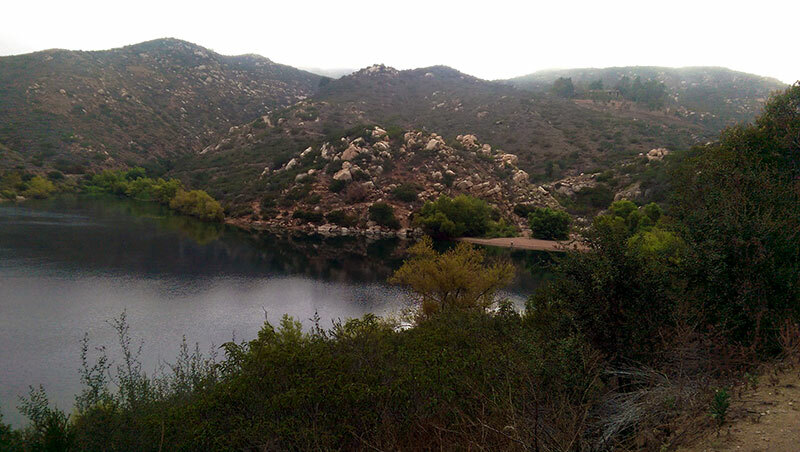 Despite the ever-increasing crowds, the hike from Lake Poway to Mt. Woodson is still my favorite in San Diego. It’s a challenging hike and an amazing workout that will keep you working from the base of the trail to the top of the summit. If you’re in good shape and accustomed to hiking hard and fast, you can conquer the hike in less than 2 hours by running down from the summit. If you’re in crazy shape you can beat that time by running up it as well. I’ve seen people do it, but they’re few and far between. 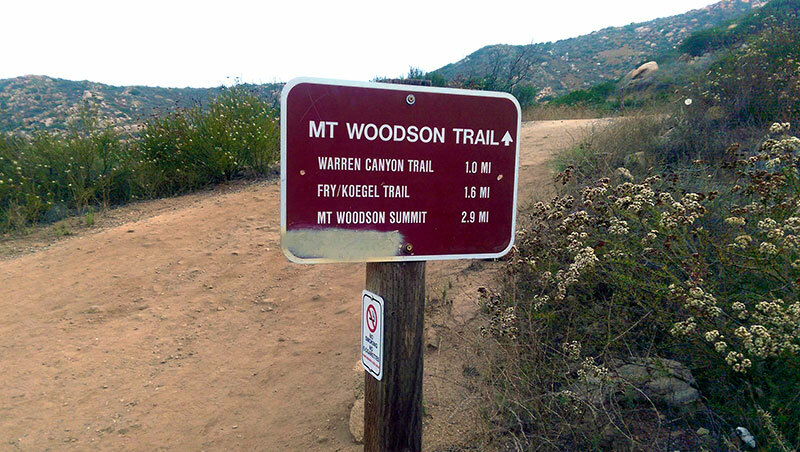 Cost – the $5.00 entrance fee can be avoided by starting at one of the alternate trailheads, but that changes the hike. The good news is that the entrance to the park is not always staffed, so I end up paying about 50% of the time. Acceptable, but not ideal. Crowds – sometimes annoying, especially if you like to hike fast or run. Most people on the trail are busy talking and/or listening to music without headphones, seemingly oblivious to simple trail rules & etiquette. Like the rule that says, if the person behind you is moving quicker than you, move over and let them pass. Which can be especially problematic when you run into large, slow-moving groups on the long, narrow sections of the trail. Neither of these factors has changed how often I hike Mt. Woodson, and they definitely shouldn’t affect your decision to visit either. If you haven’t hiked it yet, then by all means go. And go now!